San Antonio, TX – Steven McHugh, who graduated from The Culinary Institute of America’s Hyde Park, NY campus in 1997, provided advice and encouragement to the college’s newest alumni on July 3. 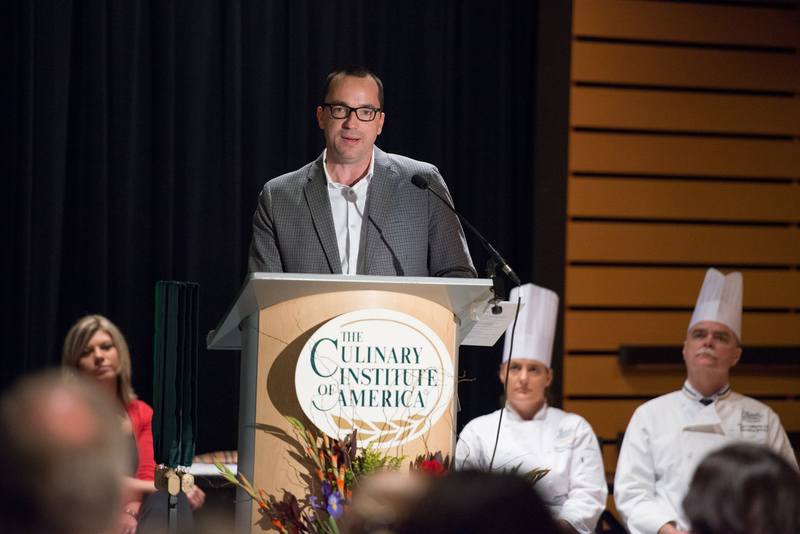 Chef McHugh delivered the commencement address at the CIA’s San Antonio campus at the Pearl Brewery complex, which is also home to Cured, his new restaurant that opened in late 2013. Cured is a sustainable, seasonal restaurant chosen by both San Antonio Current and the readers of the Express-News as Best New Restaurant for 2014 and as one of Eater National’s Restaurants to Watch. The Walworth, WI native advised the graduating class to get involved in the community, as he did following Hurricane Katrina, serving hundreds of meals to relief workers in New Orleans. His final piece of advice was to “do it before it’s too late.” Chef McHugh was just 34 when he was diagnosed with lymphoma four years ago. After completing chemotherapy, he said it was time to realize his dream of opening his own restaurant. In fact, Cured refers to both McHugh’s triumph over cancer and the house-made meats served at the restaurant.